Google Spreadsheets did create a flutter when it was announced -- and I still had not tried it out. So when it started spreading its wings and there was this news report of Panorama Software integrating its business intelligence software with Google's spreadsheet move, I knew I should take a look. I actually quite like what I see on the site -- as long as you are a Google member with a GMail account, it's super simple to sign in and start creating your spreadsheets. 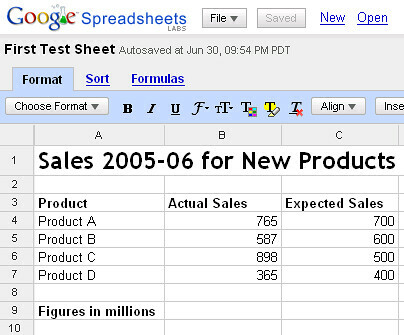 You can import your Excel spreadsheets, and save them too in Excel format. And the interface is great -- actually, it's more like a simplified version of the Excel 2007 interface -- you can't miss the fact that Google Spreadsheets has just one menu option (like the Office Button in Excel 2007), and everything else is accessible in tabs (again like the Excel 2007 ribbons). So is that where Google is trying to land its flight?